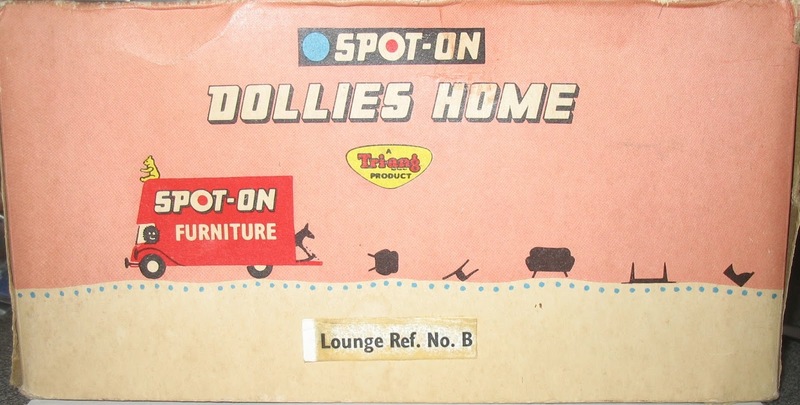 In the last post, I showed the TV chair and bookcase from this Triang Spot-On boxed set. 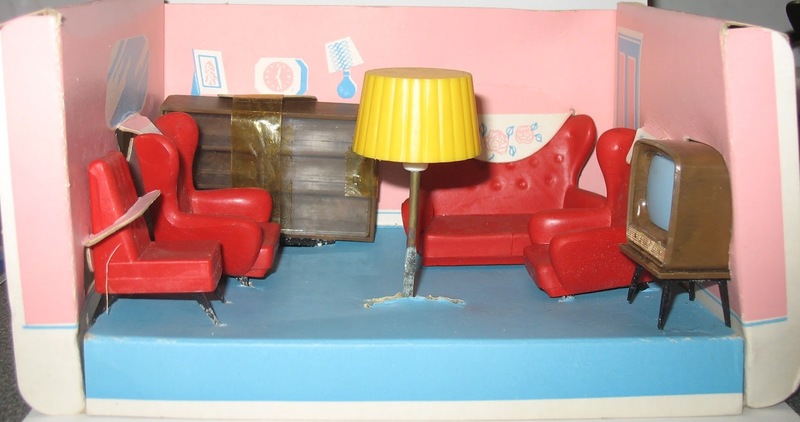 I bought this set because I love the cardboard room setting provided, especially the way that the chairs appear to have antimacassars! The three wing chairs are held in place under semi-circular cut-outs from the cardboard of the back wall. The walls are pink, but the semi-circular pieces over the chairs are white with a pink and blue floral design. They are clearly intended to represent the embroidered doilies placed on the backs of chairs to protect them from hair oil! Isn't that a wonderful detail? The other features printed on the walls are pretty groovy too - the mirror looks art deco with those streaks of glass going diagonally across it, and the lampshade looks like it's about to fall off! though the walls on this side of the room are otherwise bare. 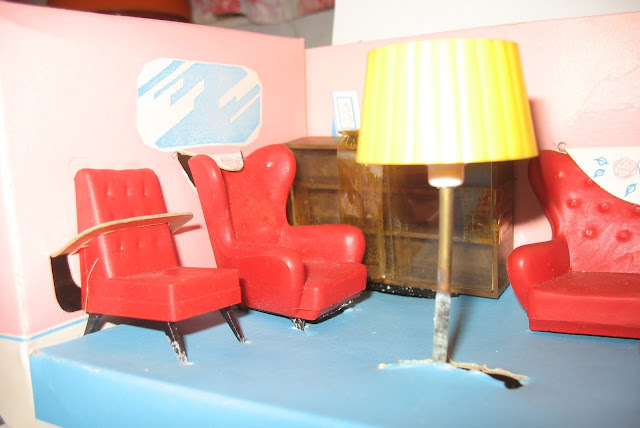 Triang very usefully give the scale of these furnishings, 1/16", on the box. 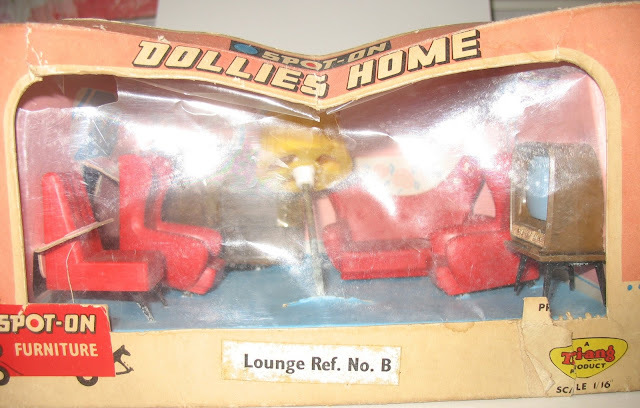 Although the front of the box has a sticker saying "Lounge Ref. No. 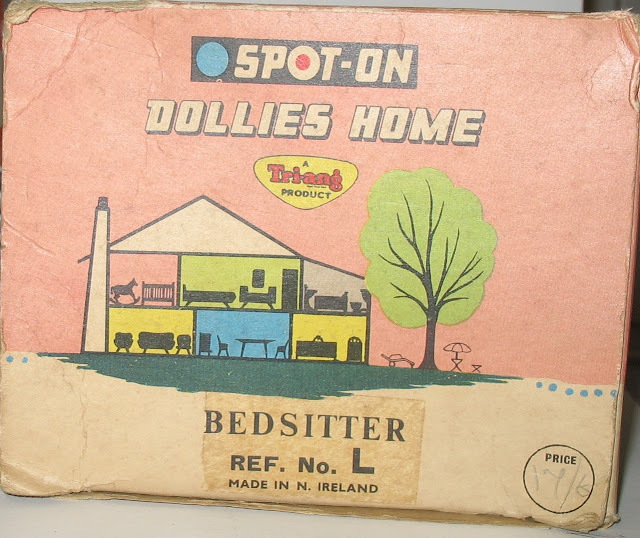 B", and it's definitely a lounge room in the box, the ends are printed with "Bedsitter Ref. No. L". I wonder if they produced more boxes for bedsitters than they needed? I love the silhouettes of Spot-On pieces shown here. Woops! Someone forgot to shut the back of the delivery van! or fall of the back of a lorry as they say in England. So interesting to see it in the original box, it must have been stock which was never sold, or a set purchased as a gift but never given, or maybe the owner was super careful and packed everything back in the box every time! 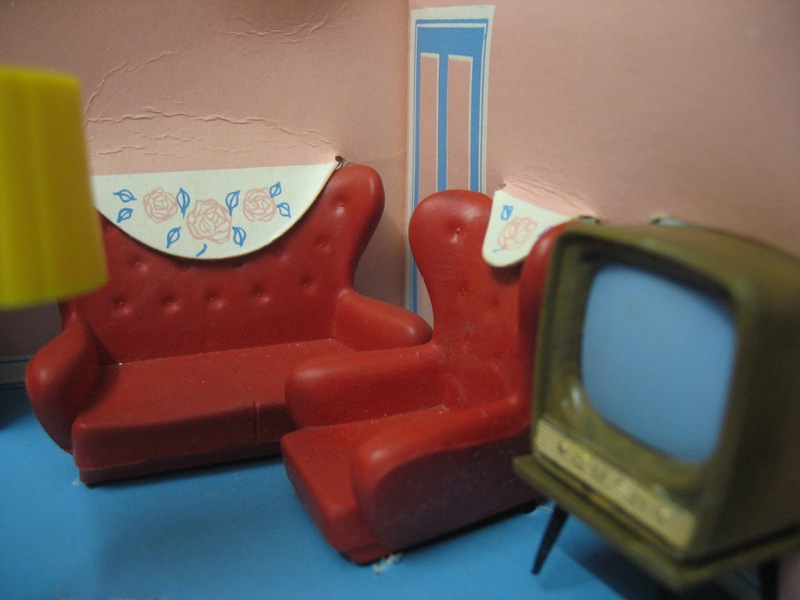 Yes, I rather think it was never sold or never given - the sticky tape had never been removed from the bookcase, and the cardboard holding the TV chair in place is quite stiff. I had difficulty getting that chair out and back in again - if it had been done often, I think the cardboard would have been creased or torn. So it's sad in a way that it was probably never played with - but I am very glad that the cardboard room setting survived for so long! Yes, made in Northern Ireland, part of the UK. 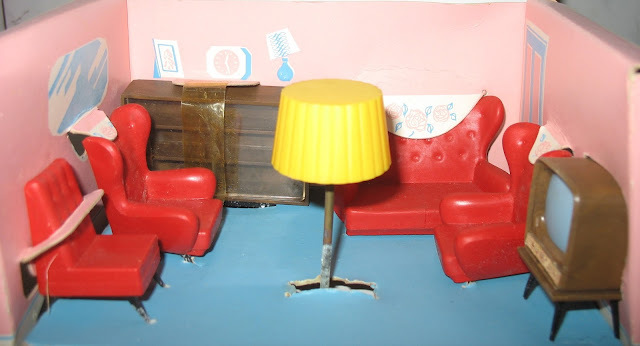 I wonder what children of the time thought of the furniture falling out, if they realised that was what the picture showed? Probably they would not have the immediate association with stolen or misappropriated goods that an adult would see! En France aussi, les objets "tombés du camion" sont des objets volés ! Je possède des fauteuils et canapés Tri-Ang, certains dans leurs emballages d'origine, mais je n'avais encore jamais vu ces coffret et surtout le dessin des meubles tombant du camion ! Mes bergères n'ont pas de têtière non plus ! Merci à vous Rebecca. Claudine à Pézenas. Two Recent Finds for This Monday! Lovely Princess Patti and Petite Princess items up for auction this week!